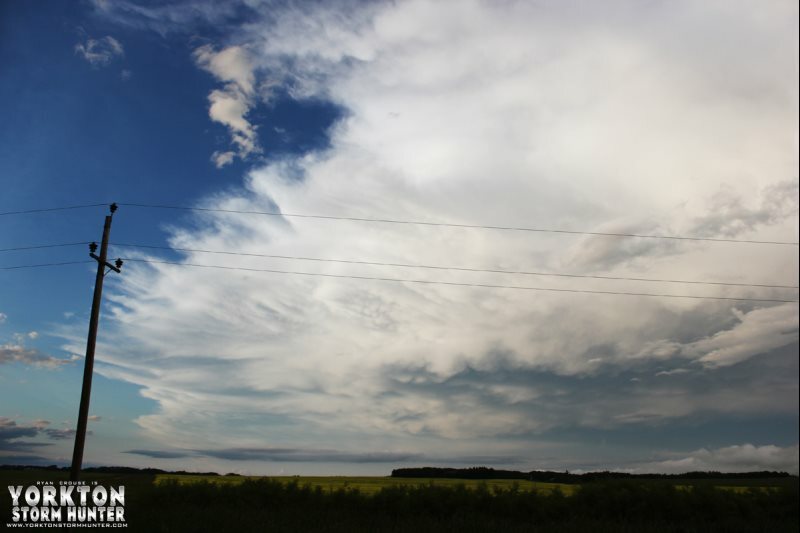 Yorkton was treated to a beautiful Thunderstorm around 9:30 pm. It was nice just to sit back and enjoy! 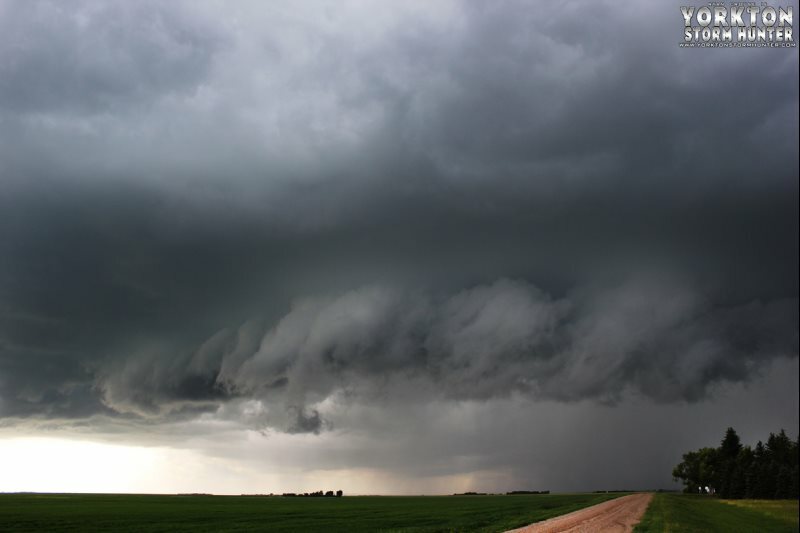 There was a Tornado Warned storm flowing North into Saskatchewan from Montana. 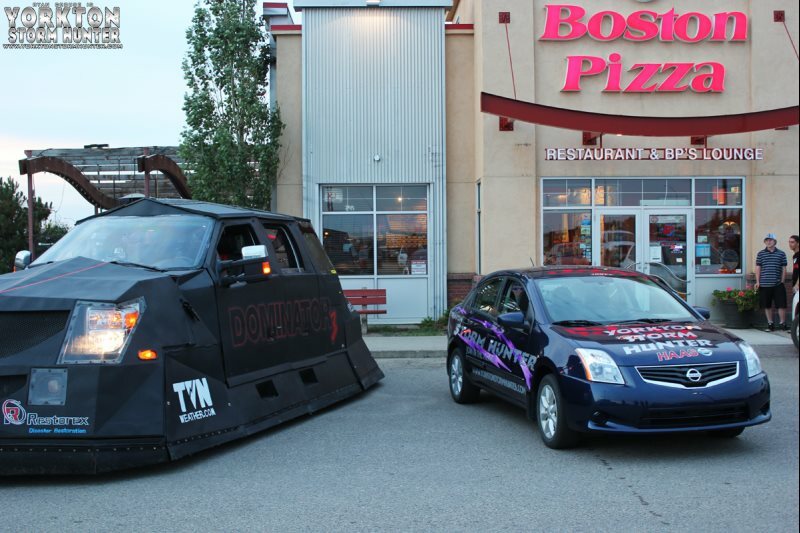 I decided that our first destination target would be Moose Jaw. 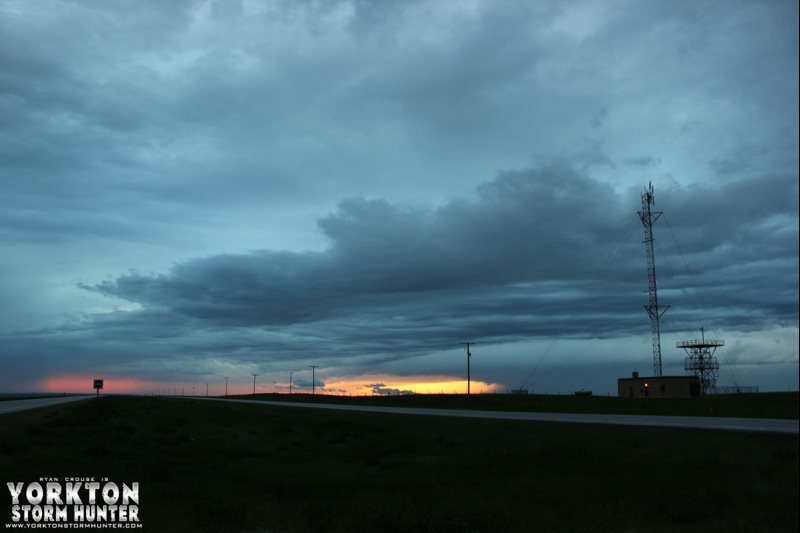 Along the way, noticed some activity on Radar South of Regina, so we ended up heading down Hwy #6 towards ? 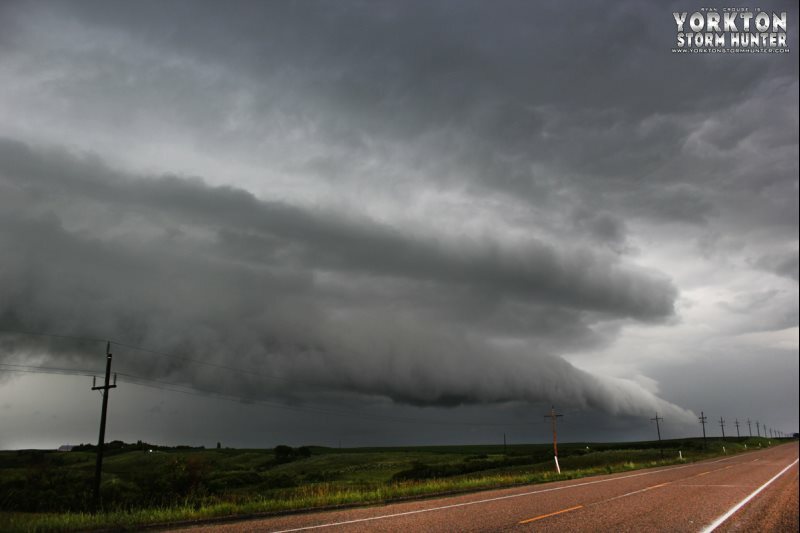 ?Rouleau where I seen a small line that had "potential" to form into a Shelf Cloud. 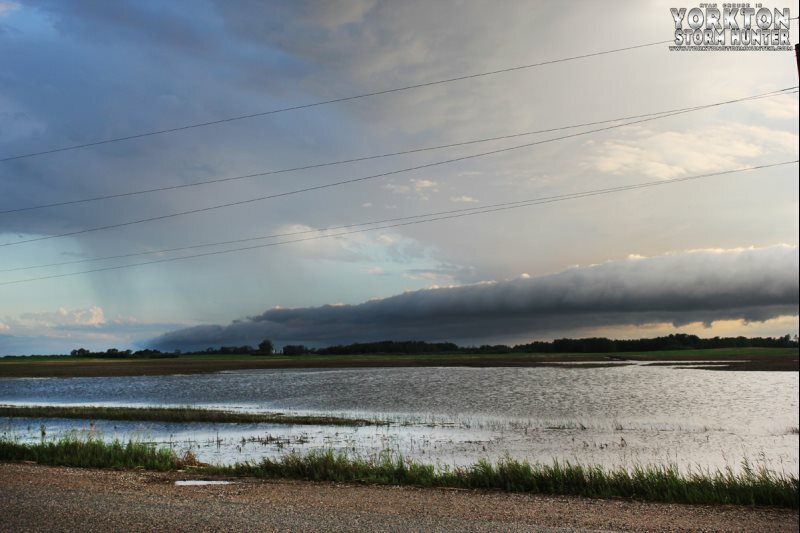 We sat close to 30 minutes or more as it formed into the biggest Shelf Cloud I have personally ever seen to date !! 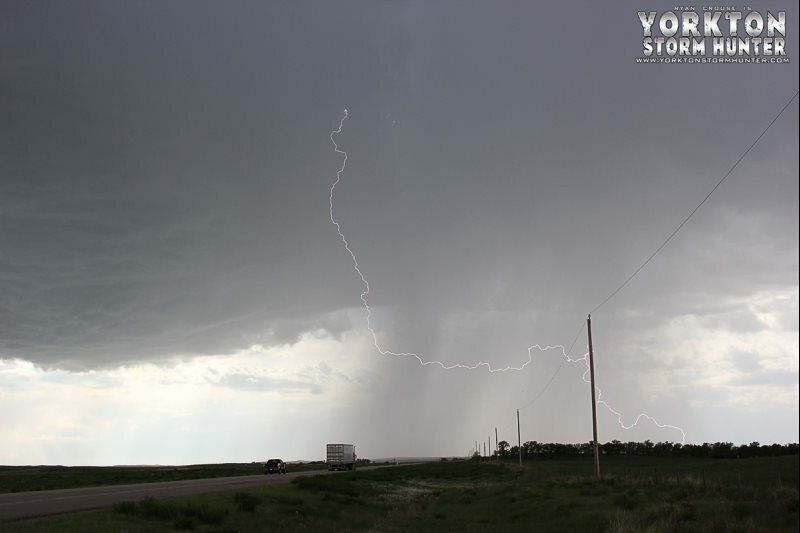 That storm produced some heavy rain, wind and some hail. From there, headed down towards Assiniboia? where we ended up calling it a day and went back to Regina to "celebrate" the season with ARBY'S lol !!! 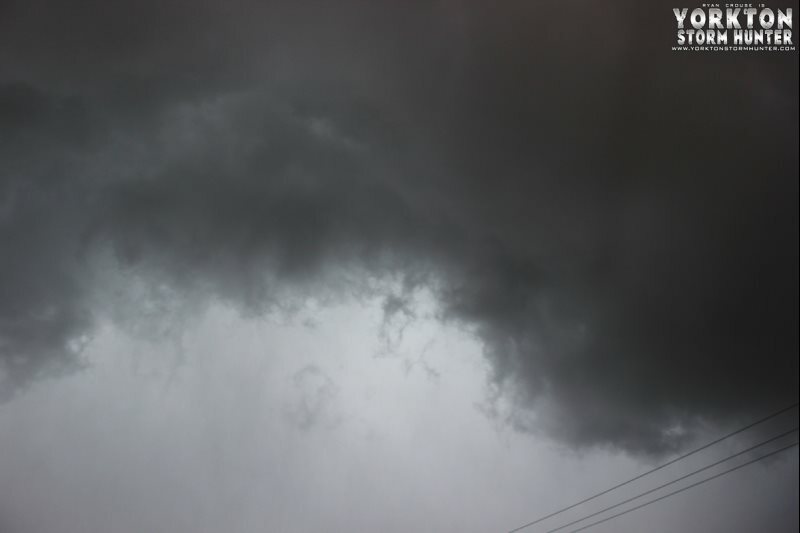 The day started out fairly slow as I didn't even plan on going out Storm Spotting originally. 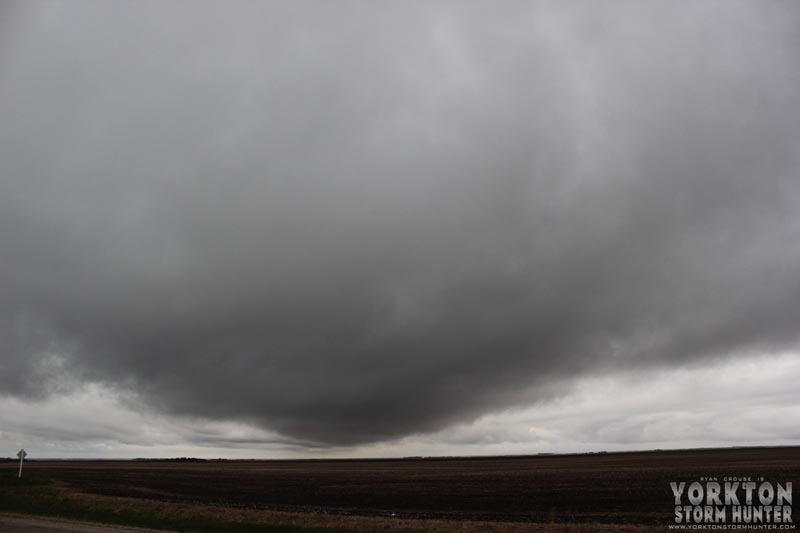 About 3:00 pm decided to head out and see what's going in the sky as there were some areas that became Severe Warned. 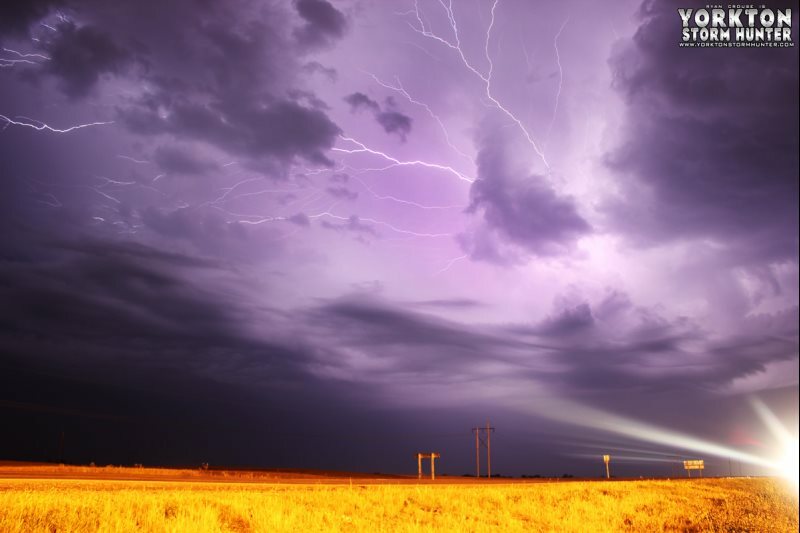 Along with Myself, and driver Chris Flasko, we had a new guest with us: amateur photographer, Brandon Crane. He was with the crew of Sean Schofer, Mike Scantlin & Connor Mcconnors. The chase day ended up being a little bit of a bust but was worth it at the end lol !! 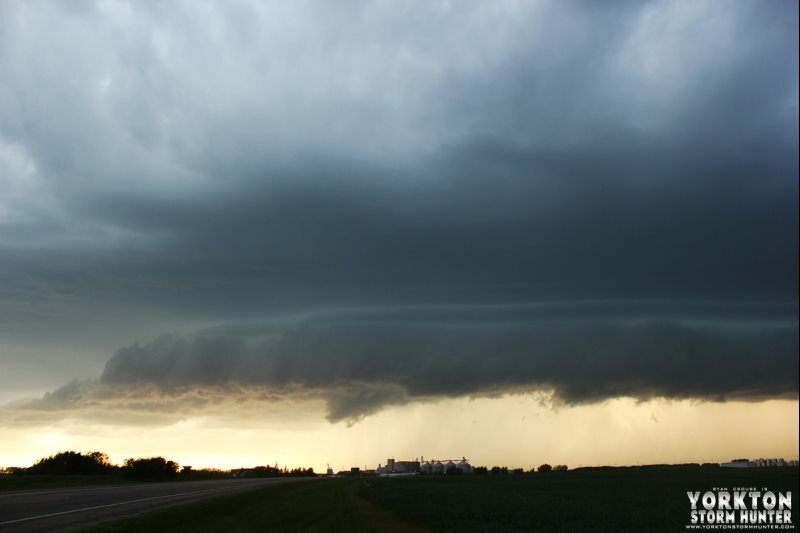 July 21 was a Great Chase Day! 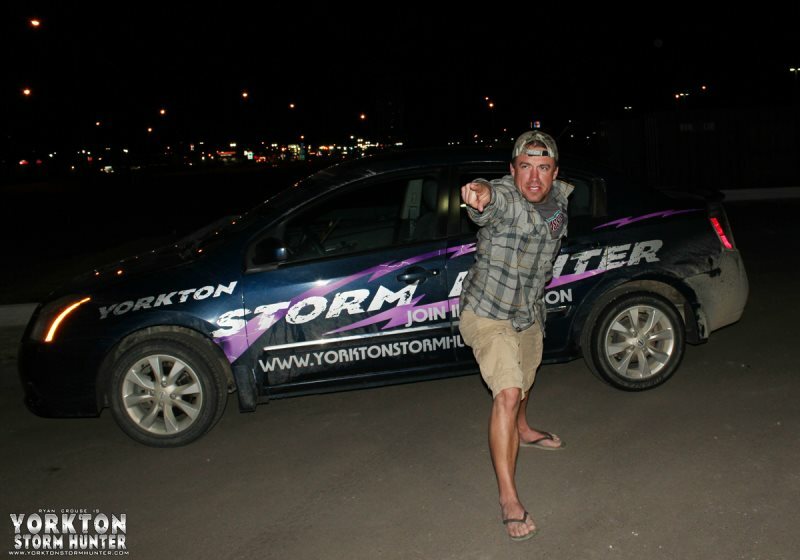 To begin with, this was the 1st OFFICIAL Storm Stream that Yorkton Storm Hunter did on TVN WEATHER. Our 1st Destination was Redvers SK and then off to OXbow. 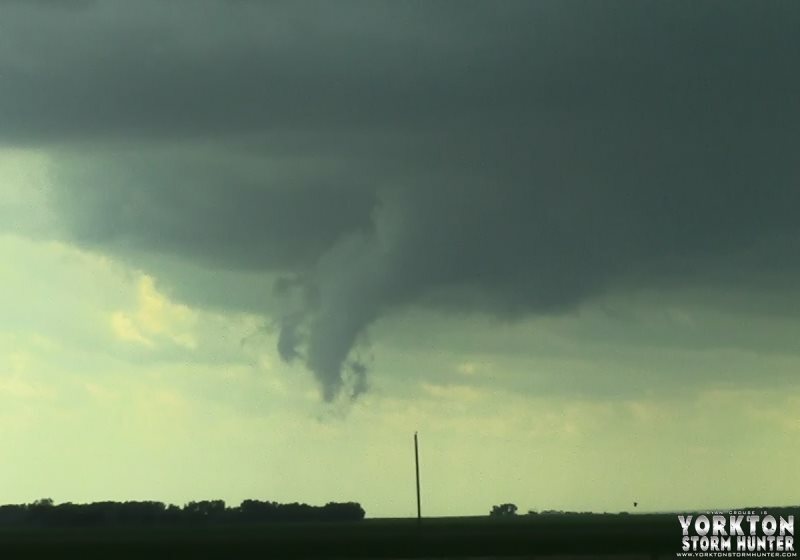 Folling that, live streamed a Funnel Cloud near Carnduff and then headed towards Melita MB where the storm was Tornado Warned. 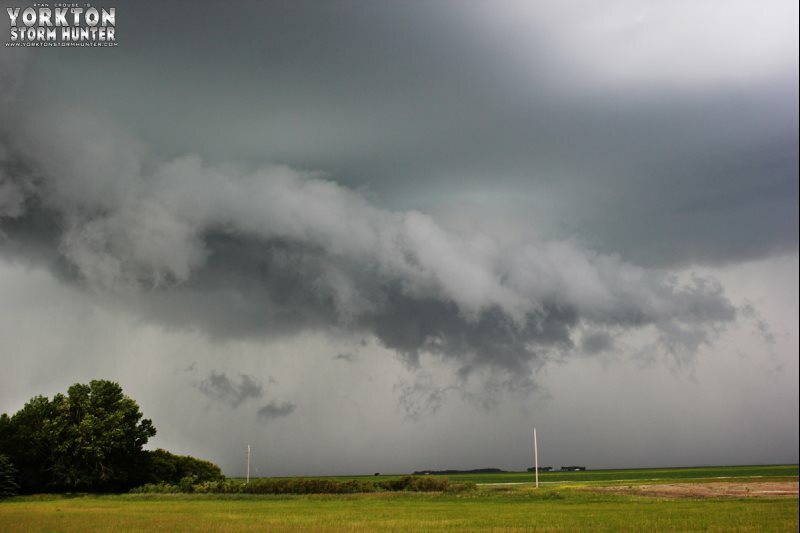 Drove past Deloriaine MB where we caught an AWESOME Shelf Cloud (and seen a Cougar in the ditch below) and up to Killarney MB before calling it a day! 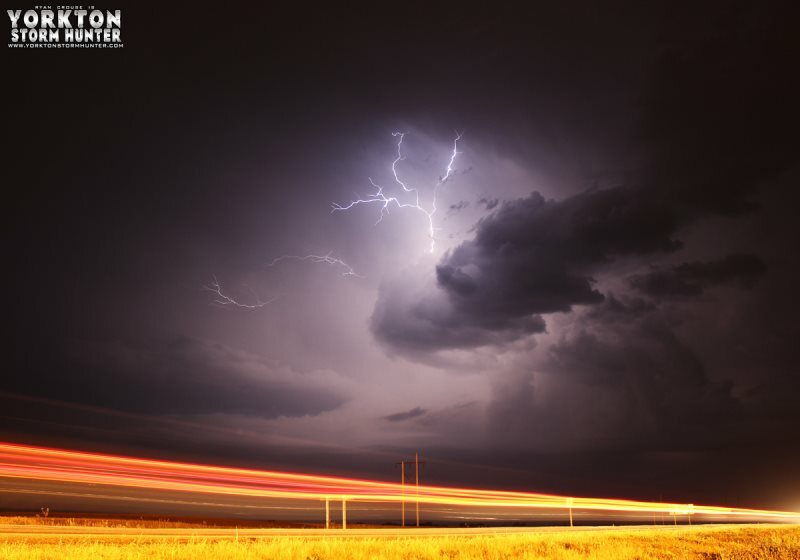 11 hours on the road and 1st OFFICIAL Chase on TVNweather = EPIC!! 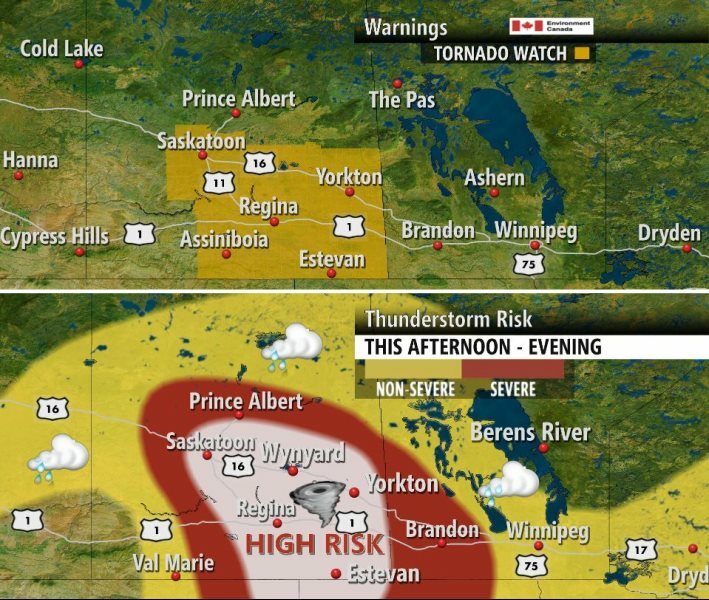 "'Oklahoma-style' t-storms for Saskatchewan today ... Likely will be the most violent storms in N. America, possibly the world." 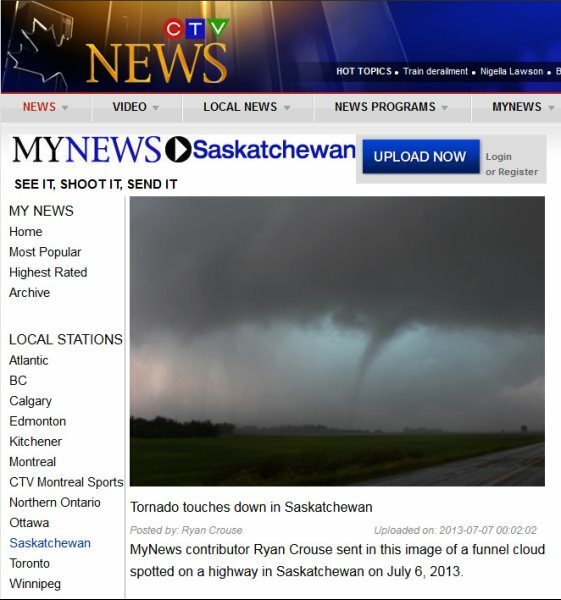 With that said I gathered my team together being Chris Flasko (Driver), Katie Vickers (2nd set of Visuals and Photographer) and myself and began by heading to Regina and then South on #6 Highway where we a caught a wild Funnel Cloud. On way way down #6 (sort of closer to Rouleau SK. 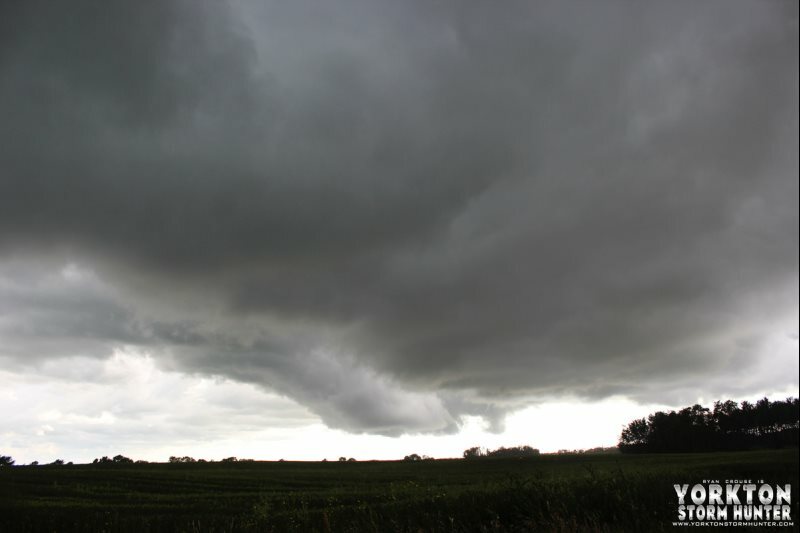 ), ha d a few great photo opportunies of a Rotating Thunderstorm as well as a nice Shelf Cloud - was also passed by the DOMINATOR 3. 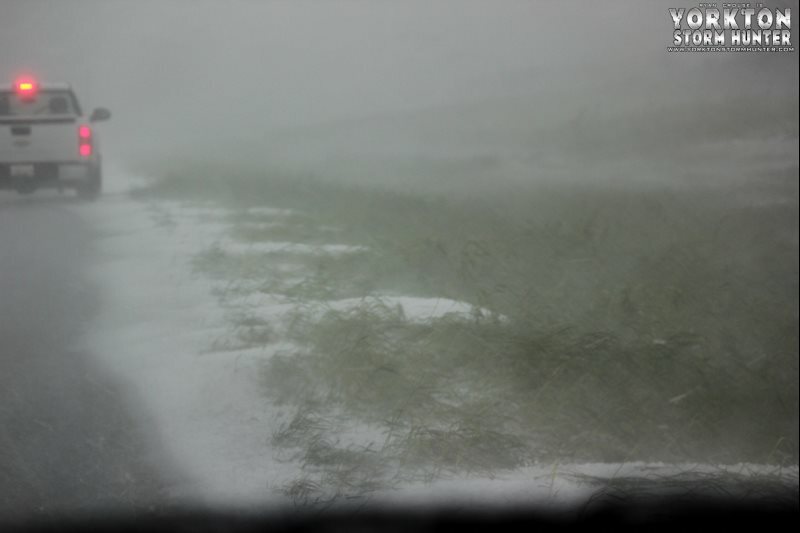 Then came the hail! 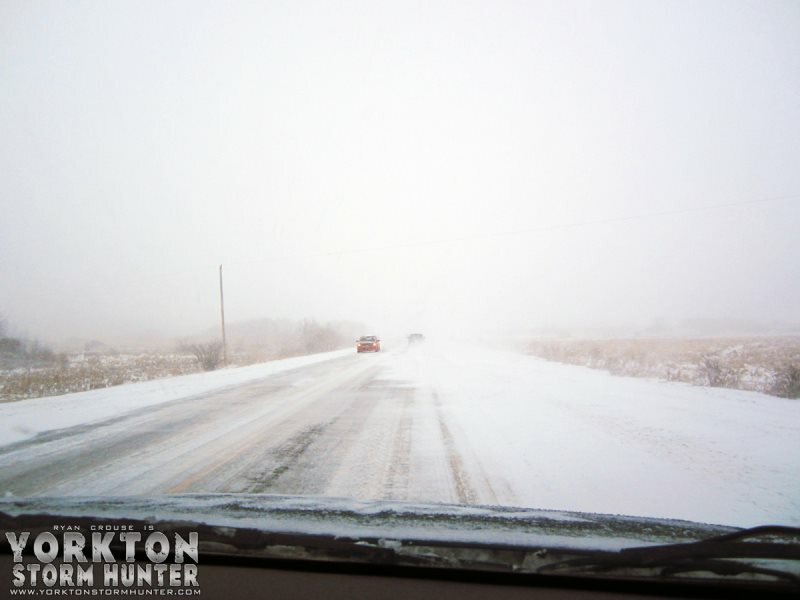 At this point we began to head towards Kronau SK. 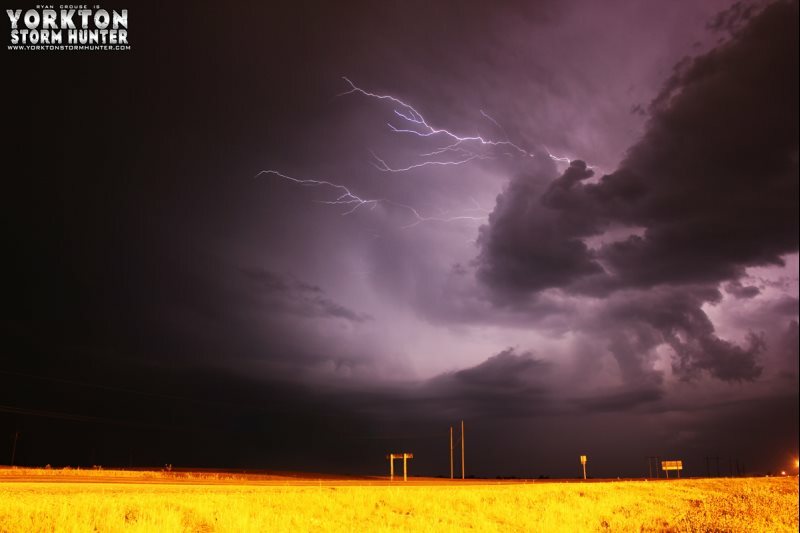 where we were wrapped in some intense rainfall and seen Michael Phelps of STORMSCAPE LIVE TV (One of the Storm Chasing Greats). 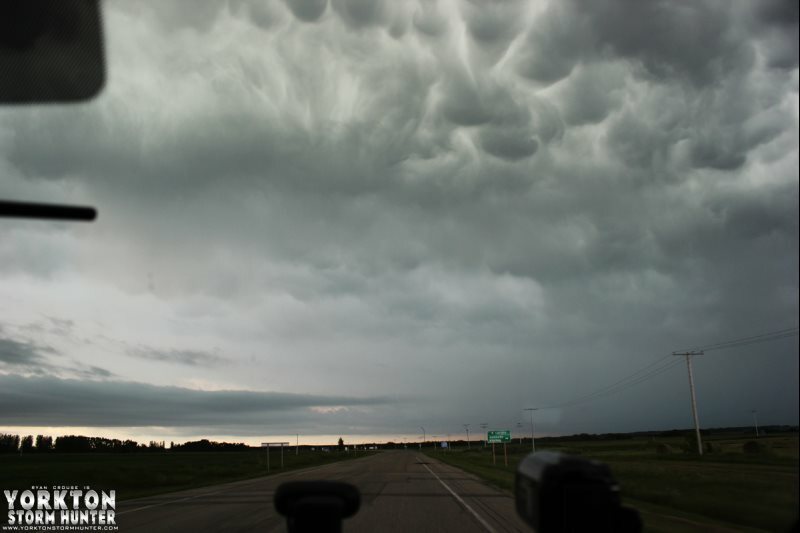 At about 5:15 pm, we were then on route to Weyburn SK. 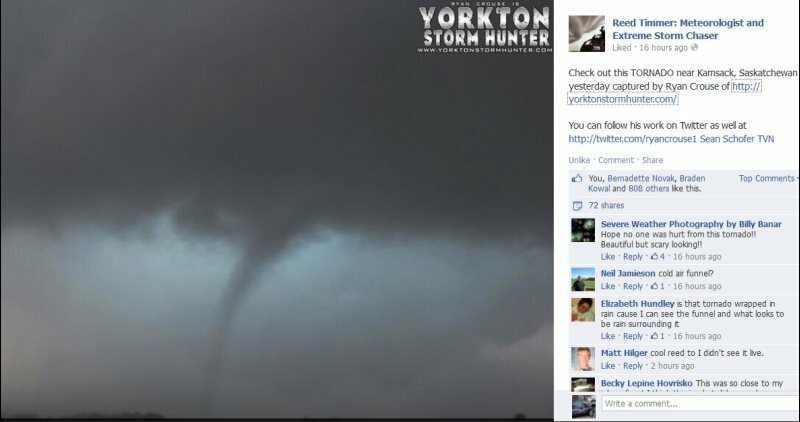 as I posted a Message for my Social Media followers back home at Yorkton, SK. 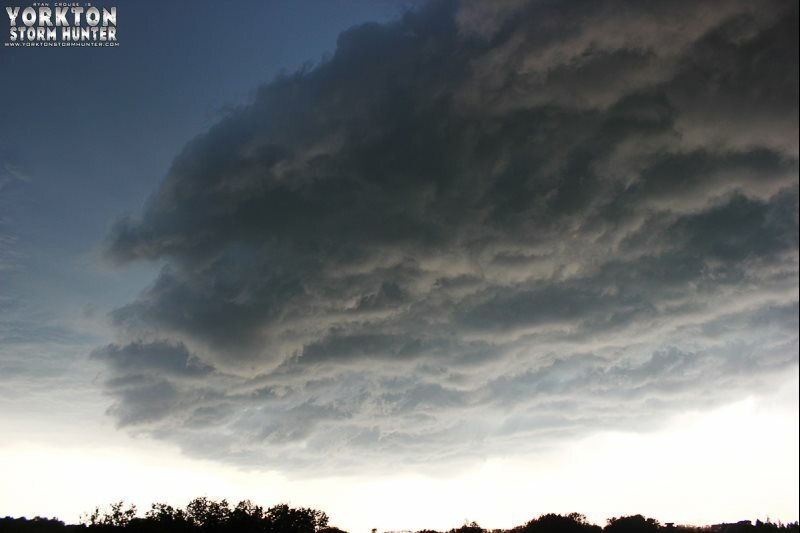 to be safe as a Storm was near by. Followed some cells, got some more cool photos and also seen again and this time stopped to visit Michael Phelps. 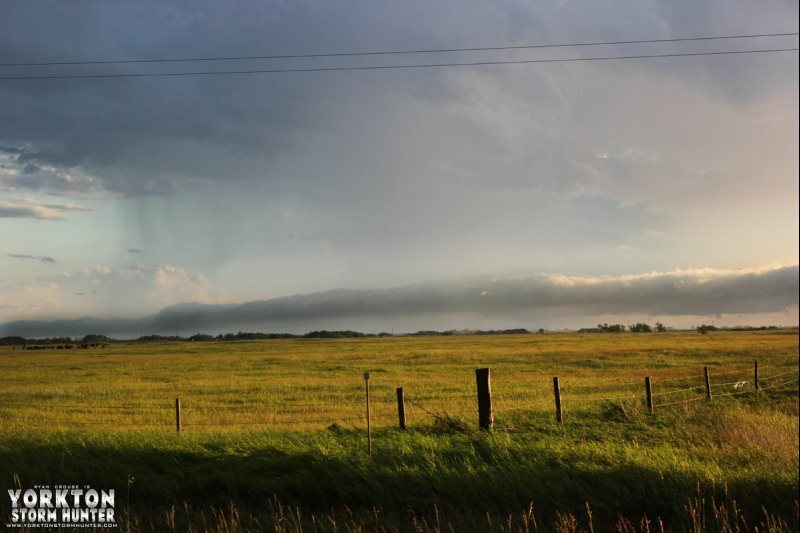 From there, headed towards Estevan SK. where the storms stayed in the USA so we ended up turning back and calling it a great day! Active Chase day to say the least!! I didn't have my driver so that my my job for the day (on top of tracking the Weather patterns when pulled over). So Katie Vickers and I set up towards our first target being Carlyle Sk. 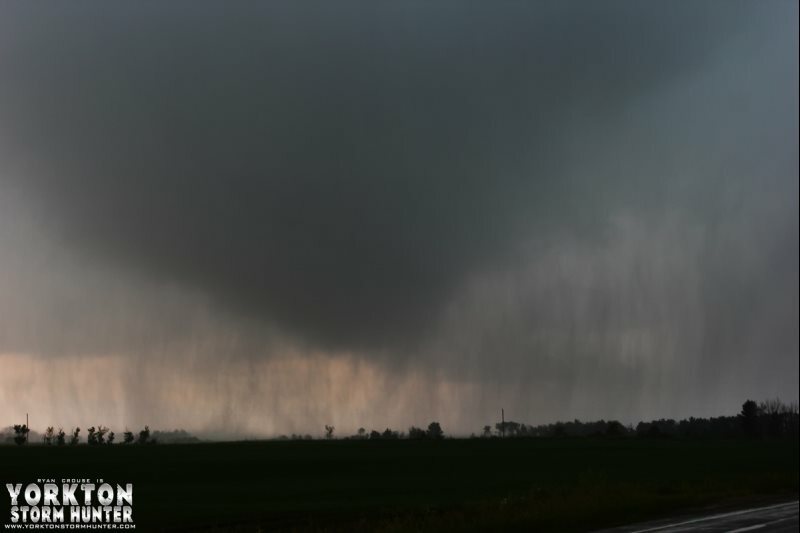 As we got closer on HWY #9, we get stuck right in the middle of an intense Hail Storm that lasted for several minutes and as we pulled over, we were passed by the DOMINATOR 3. Once that was said an done, we were on our way down HWY #13 to get to Redvers SK. 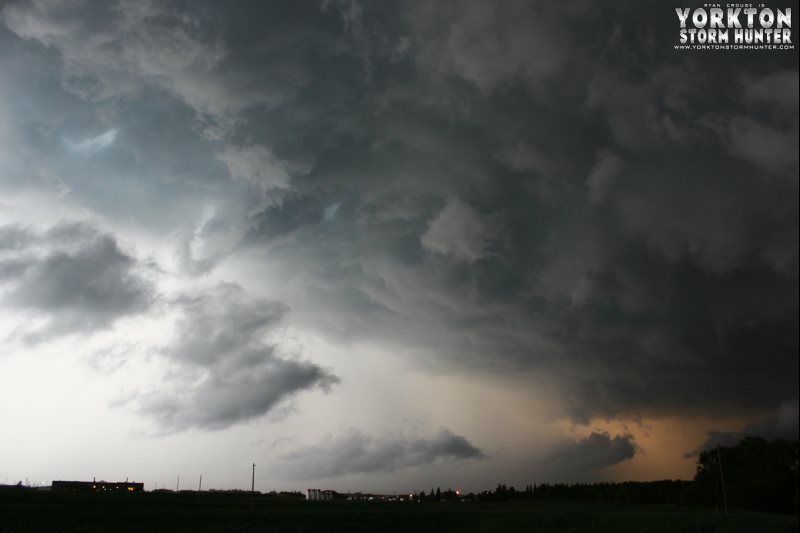 when I noticed the sky on my side of the car turned bright white and all of a sudden a TORNADO formed right on the highway! 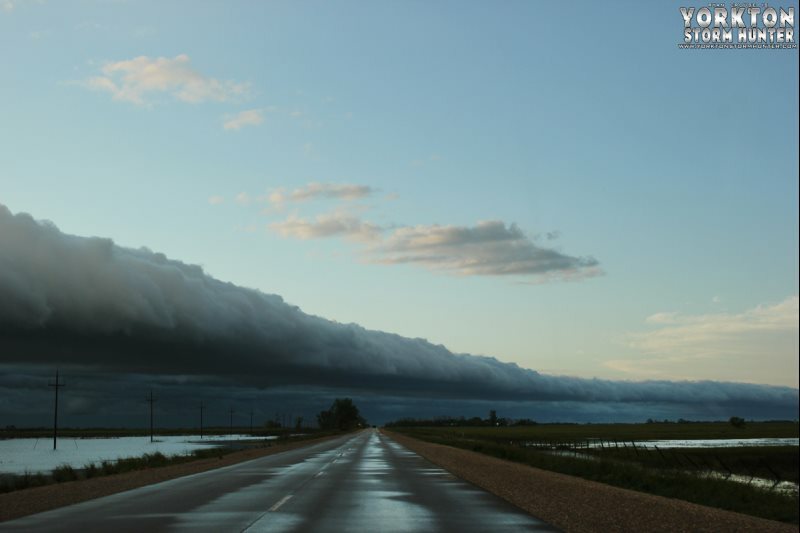 Knowing that nobody was behind me, hit the breaks and backed up to stay at a safe distance.It went across the road, into the ditch and began to hit the field as it dissolved. All while I was backing up. The people watching the stream got to enjoy it, but we got no photos of it. 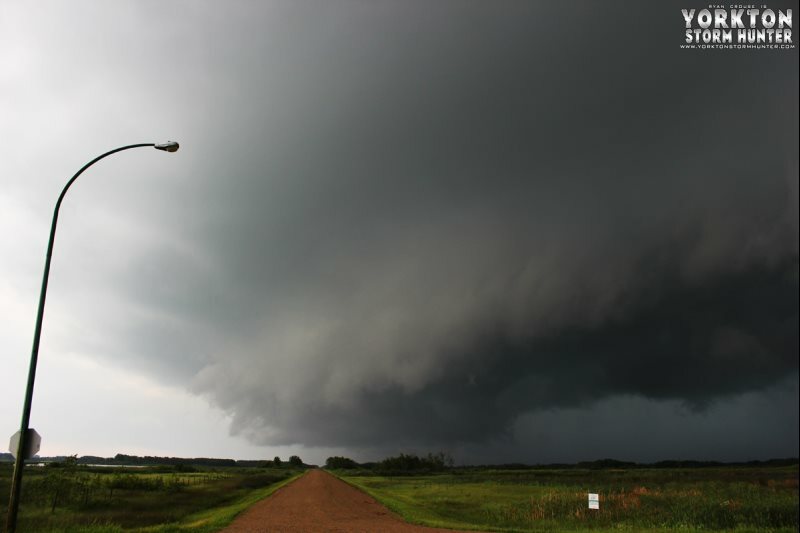 Called it into Environment Canada and continued on with the next target being PIPESTONE MB. 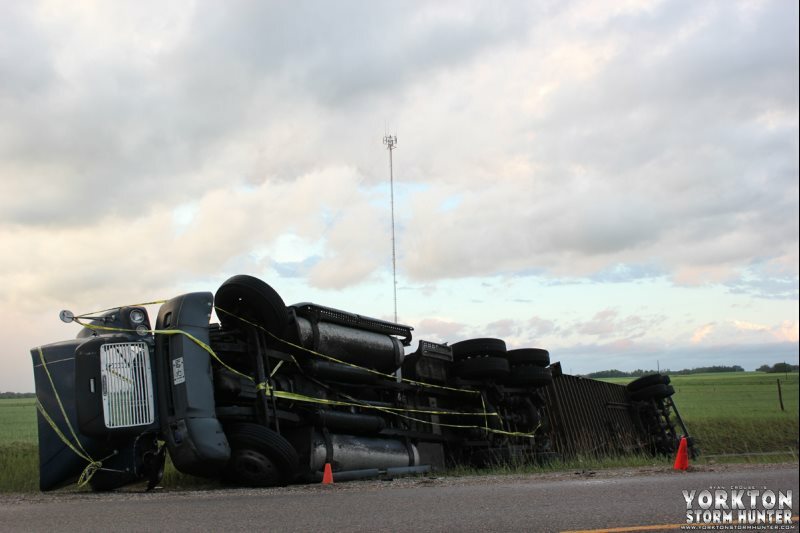 Tragic to see what happened as PIPESTONE MB. 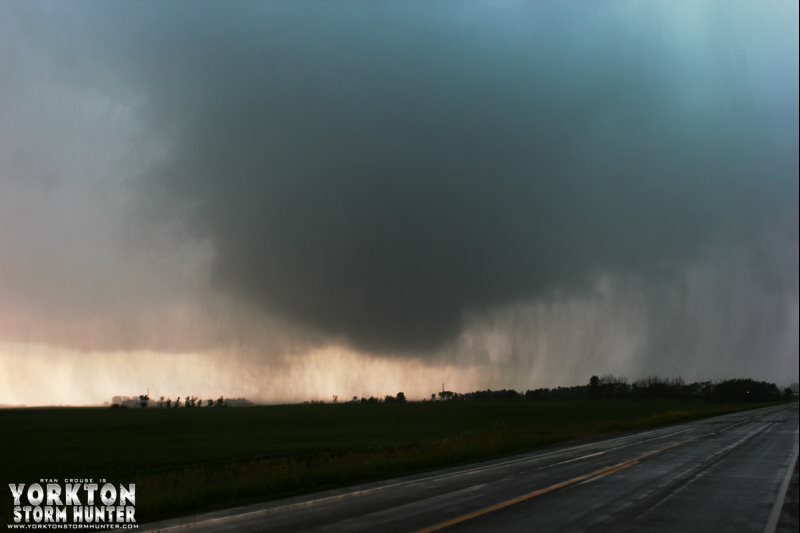 was hit by a TORNADO (possibly 2) as well as a PLOW WIND literally 7-10 minutes or so before we got there. 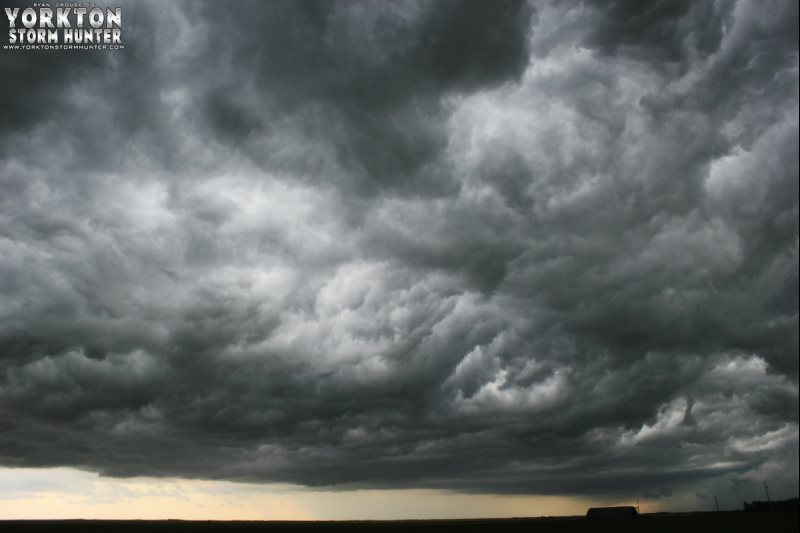 The rain and winds I had to drive through was like nothing I have ever experienced! 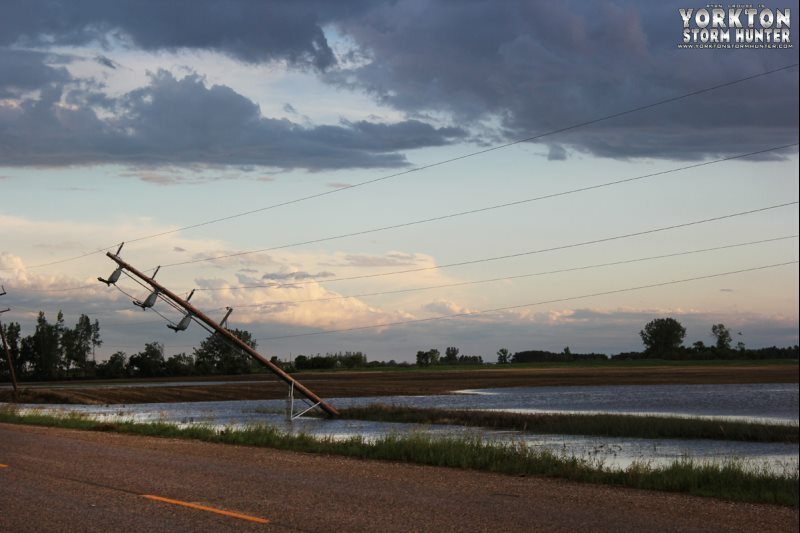 Upon arriving at Pipestone MB, noticed that there were bails on the highway, a few Grain Bins literally shredded right up, powerlines down, a Semi flipped and structural damage in the town. I did not take any photos of the town to respect their privacy at that time. 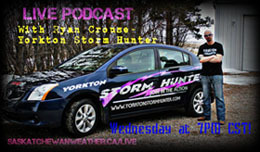 I got a very cool email first thing in the morning and as of right now I, as "Yorkton Storm Hunter" have been asked and gratefully accepted to be LIVE STREAMING on the BIGGEST Network, along side with the BEST Storm Chasers/Spotter in the friggin WORLD! 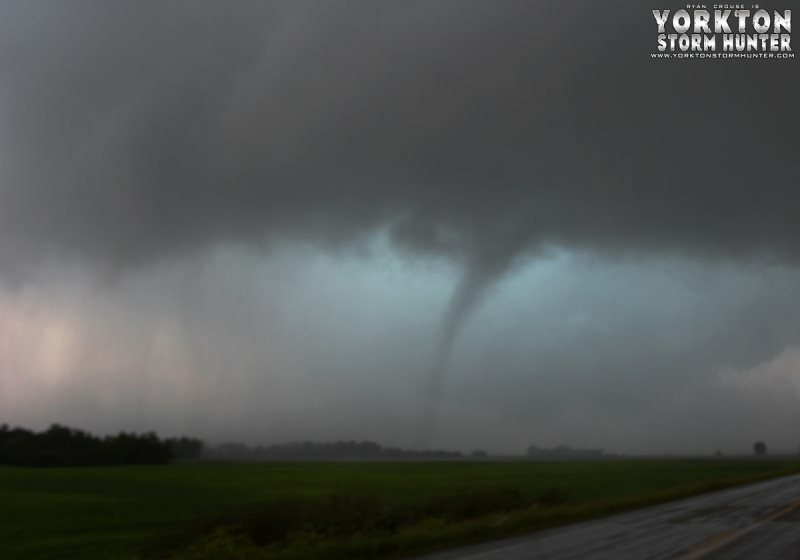 As soon as I get everything fully set-up (about 90% there), when I am out Storm Spotting, my Live Stream will be see on TVN WEATHER !!! 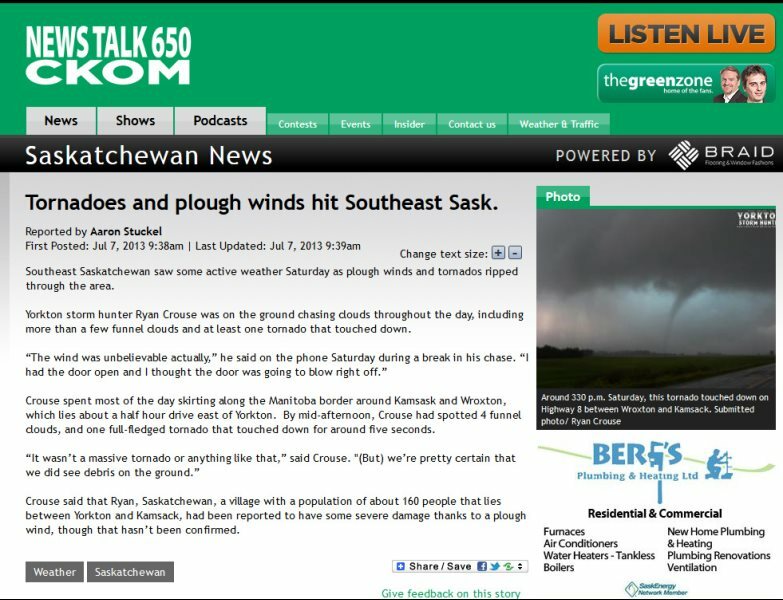 CHASING @ WROXTON, KAMSACK, CHURCHBRIDGE - TORNADO(S) SPOTTED!! What an AWESOME chase day!!! 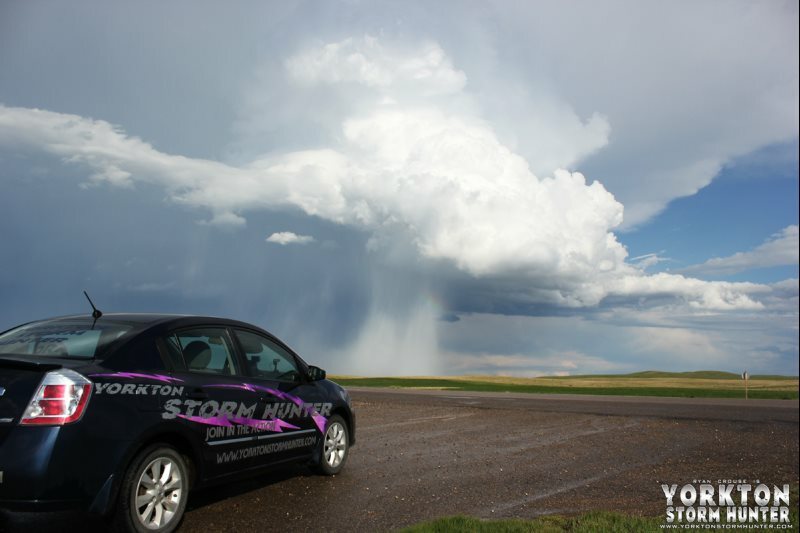 Started the day off with the myself and the Storm Car in the Yorkton parade and immediately right after bolted out as a Severe Thunderstorm warning was issued. 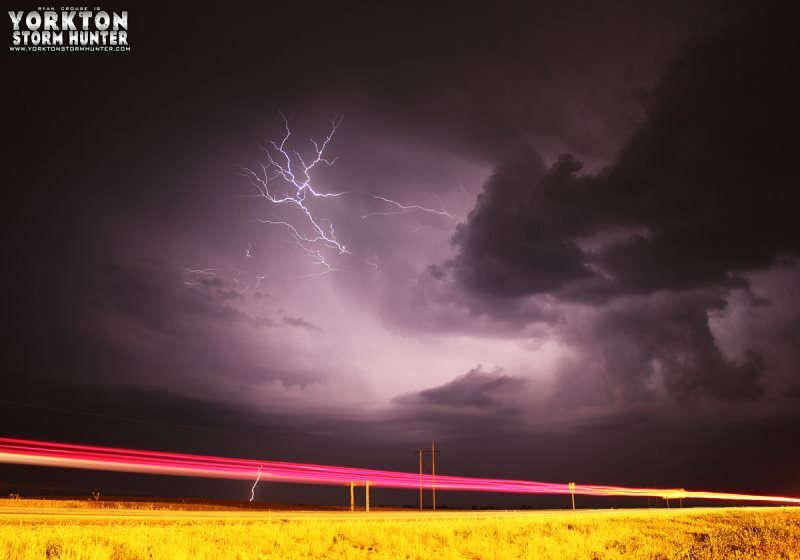 Within seconds of finishing, myself and Chris Flasko (who was the awesome driver so I could focus on the radars and track the weather path), headed out towards the Melville area where Owen Parker sent me in a tip of a wild Shelf Cloud. 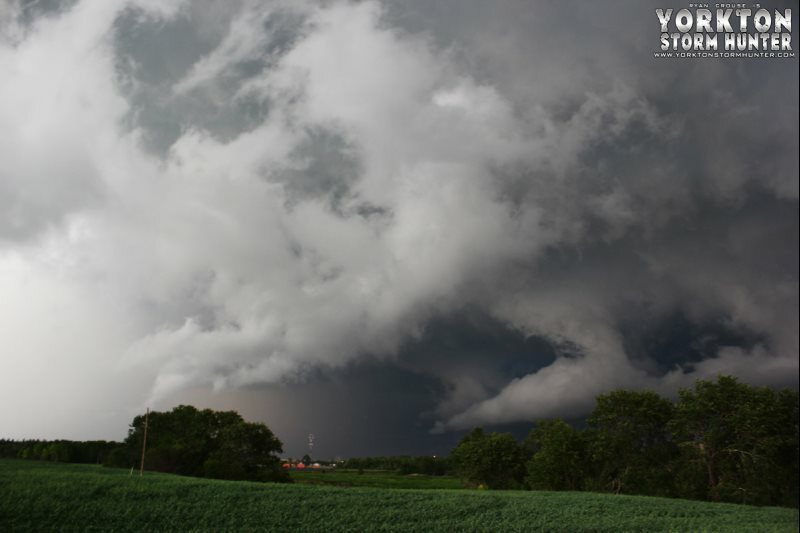 We caught up the shelf and got some great shots. 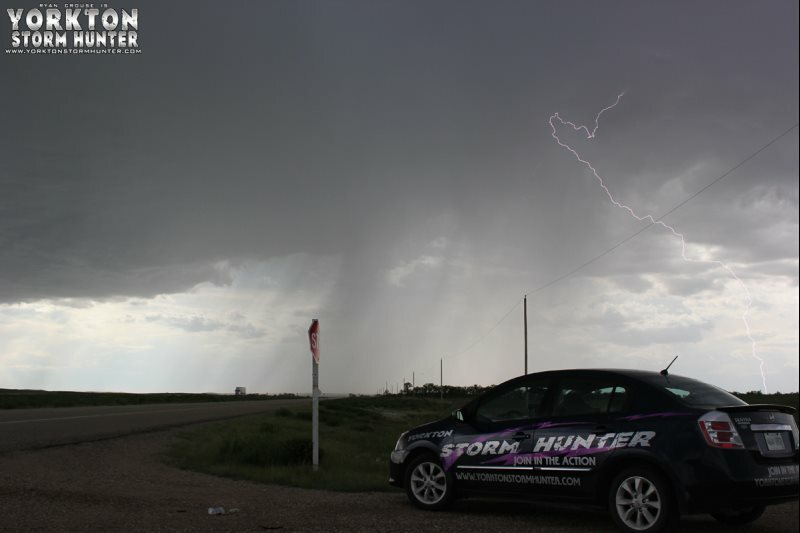 From there we chased the storm to Churchbridge and then North past Wroxton and towards Kamsack. 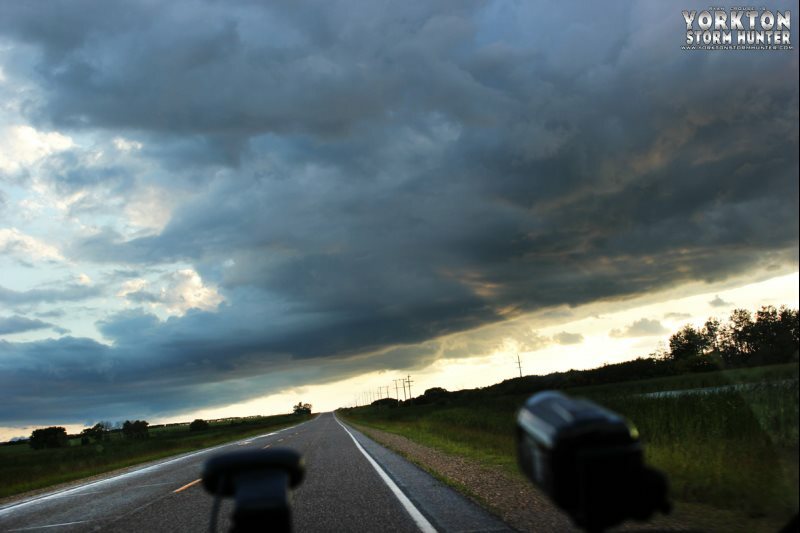 Just a few miles before Kamsack, things got intense, and fast! 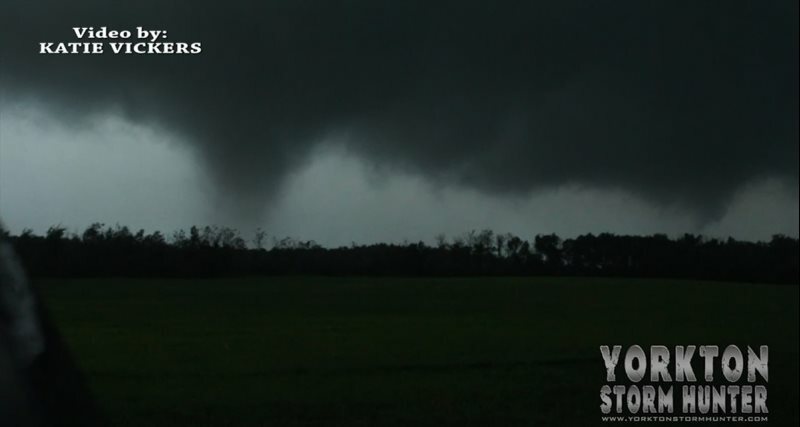 2 Confirmed and a 3rd unconfirmed Tornado (all pretty much at the exact same time)! 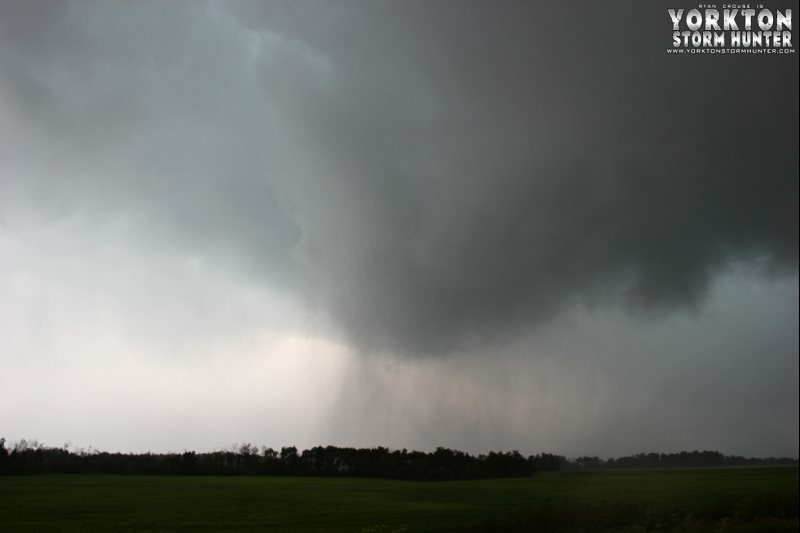 We were in the center of the rain as it was rotating all around us as another funnel began to form!!! Was a very cool experience!!! 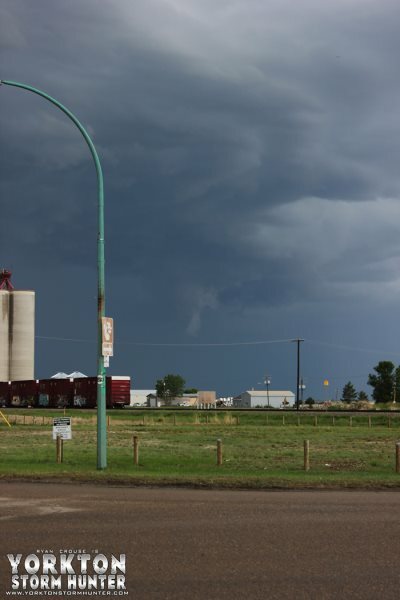 When I called into EC, it was funny as I said We have 2 funnels and I am currently watching a Tornado in front of me, the lady was like what do you see now? 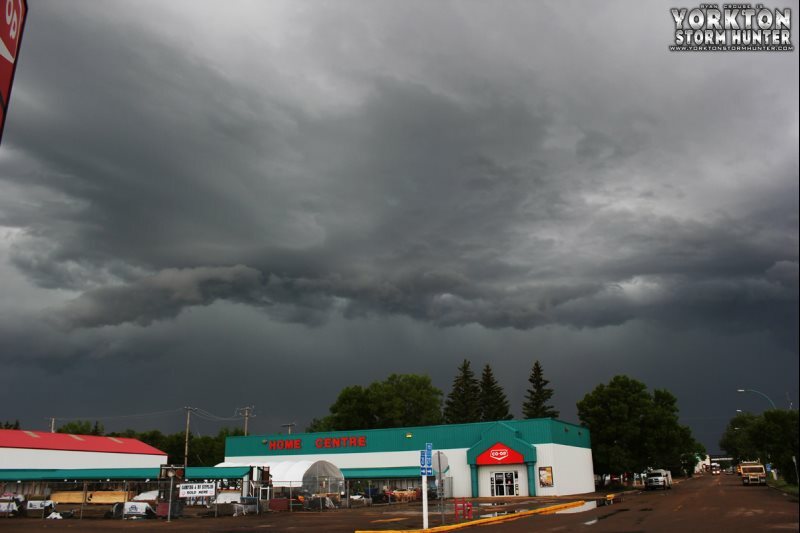 I parked right across from the Yorkton History Museum and watched this beautiful, vibrant and FAST approaching Shelf Cloud as it ripped right through the city. 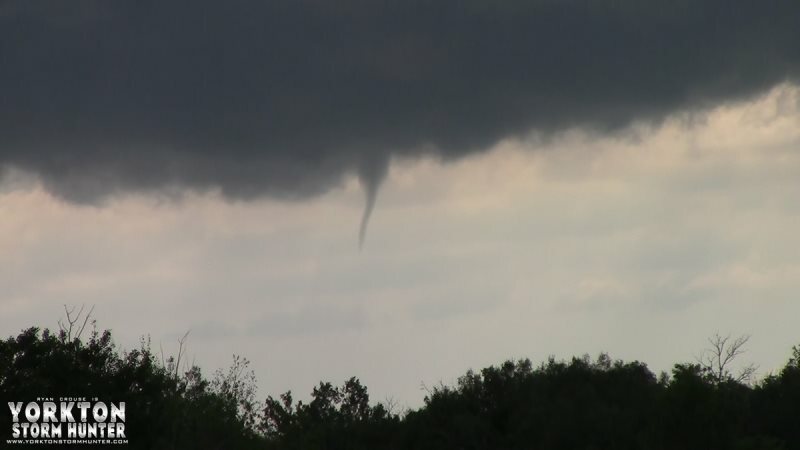 There were about 2-3 different Funnel Clouds spotted - no reports of any touching down. 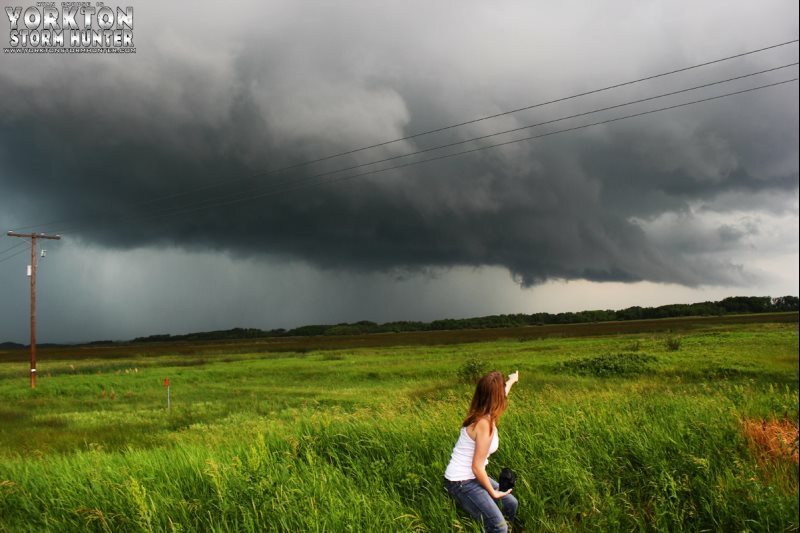 What a great chase day on !! 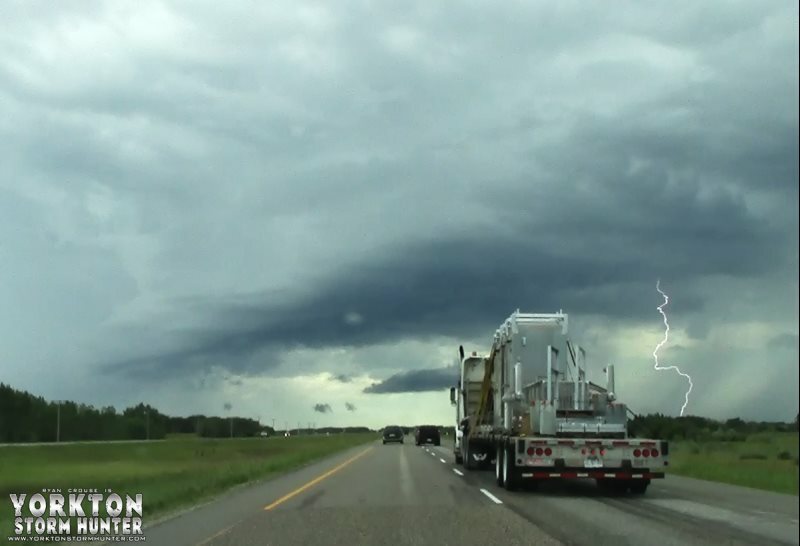 Notanee Bourassa (who taught us all a lot of weather related info along the journey), Tia Griep, Braden Kowal and myself headed out towards the Swift Current & Maple Creek area aroung 5:30pm. We had some issues with the Live Stream as we were streaming through Notanee's "TEAM RAIDEN" on the TVN Network and also streamed through SEVERE STUDIOS. 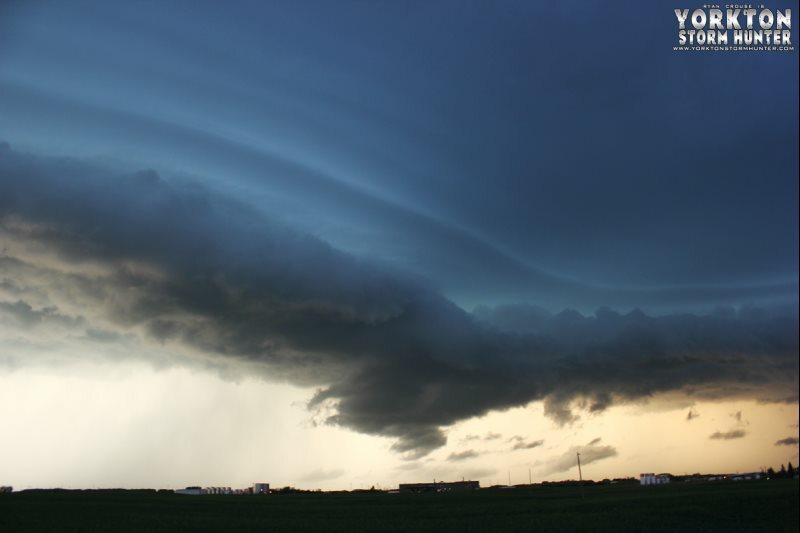 Started off Great with an awesome Rotating Shelf Cloud right over Regina. 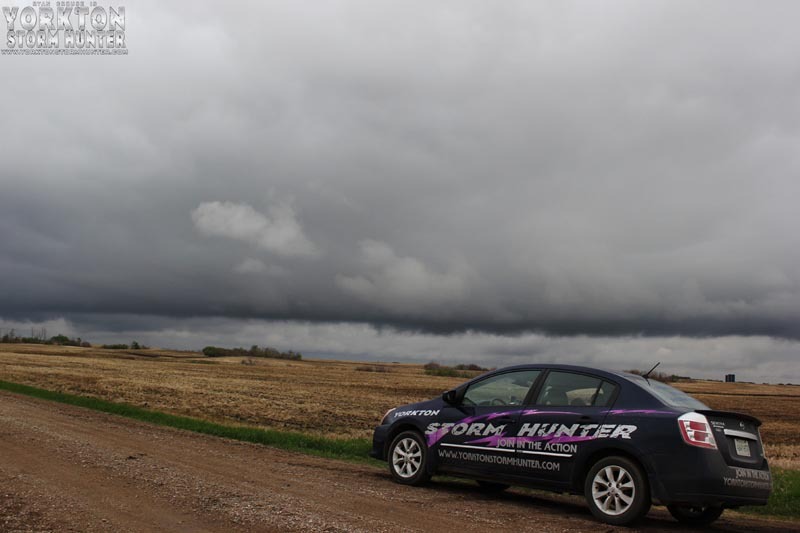 From there we ventured towards the Swift Current/Maple Creek area where we met up with Extreme Tornado Tours !! 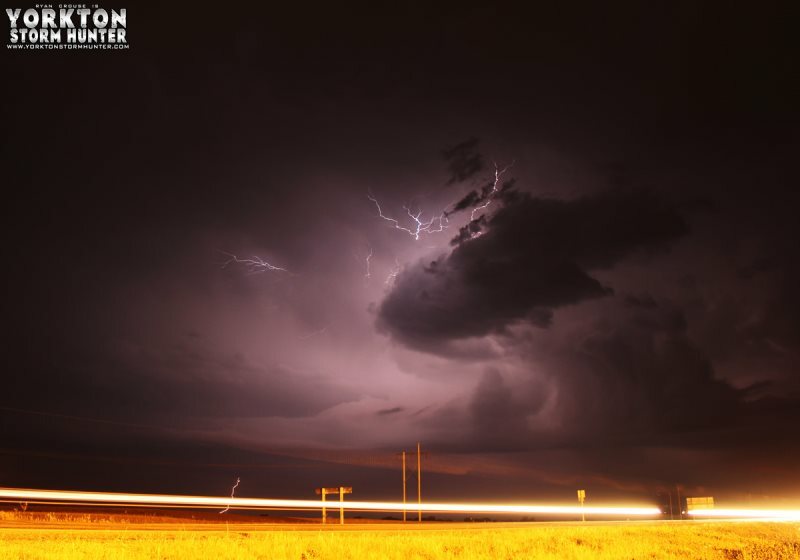 After that, caught a late night and LOW shelf cloud before calling it a night (after 11:00 pm)! WOW ... what an awesome day!!! Began by leaving Yorkton at around 9am and heading towards my 1st target - Swift Current. 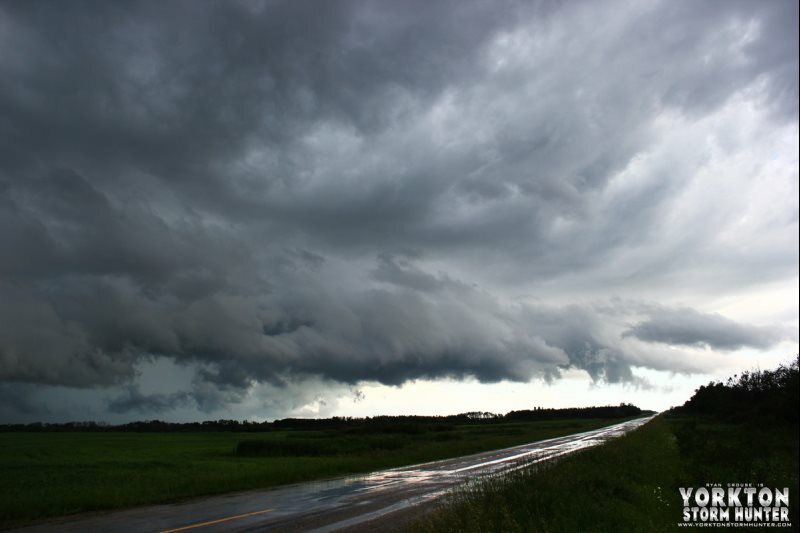 From there planned to go towards Medicine Hat where near the border got NAILED hard with heavy rain and hail. 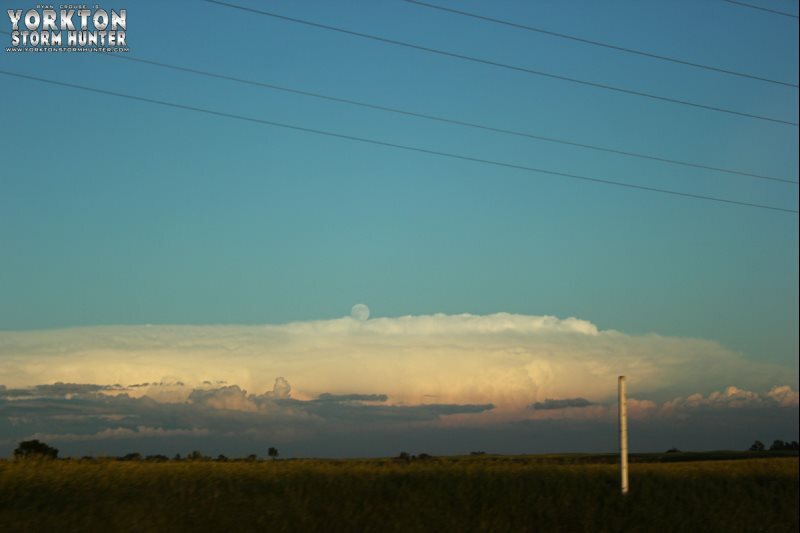 Following that seen a Massive storm cell in which the Echo Tops of it was over 40,000 feet according to NAV Canada. 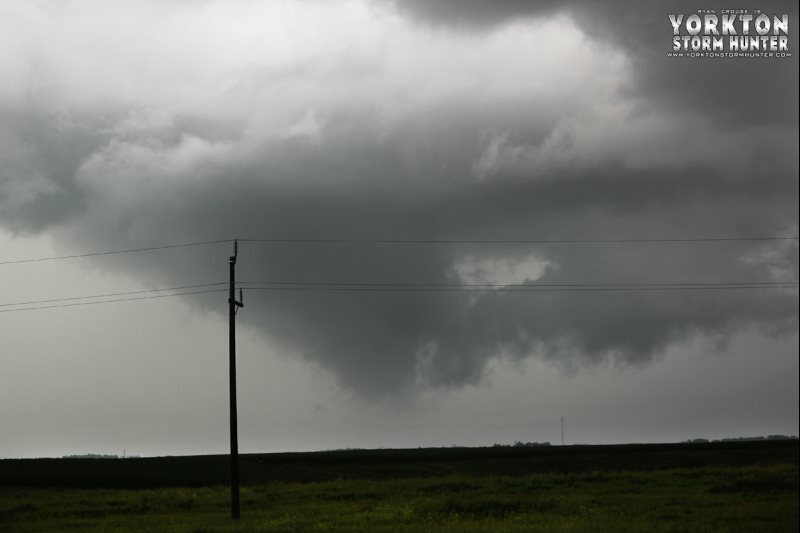 From there headed to Maple Creek where we seen a Funnel Cloud. 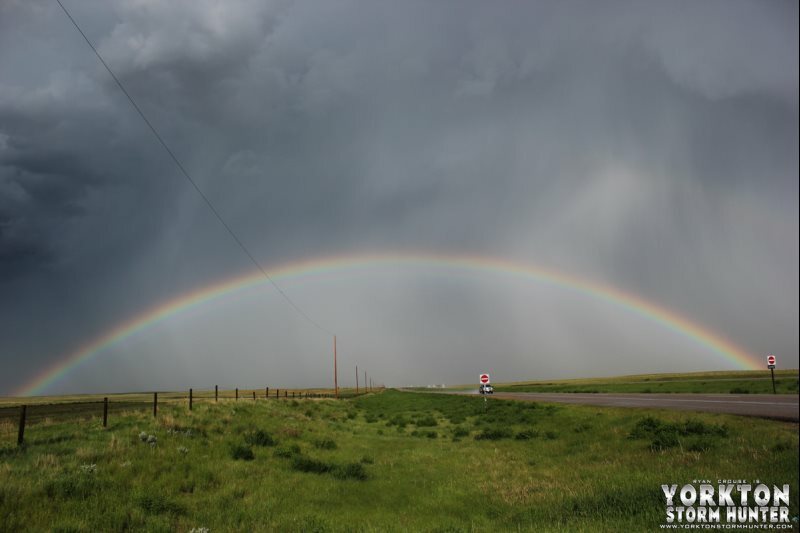 After that, headed North on Hwy 21 toward Golden Prairie where the lighting was Awesome!! 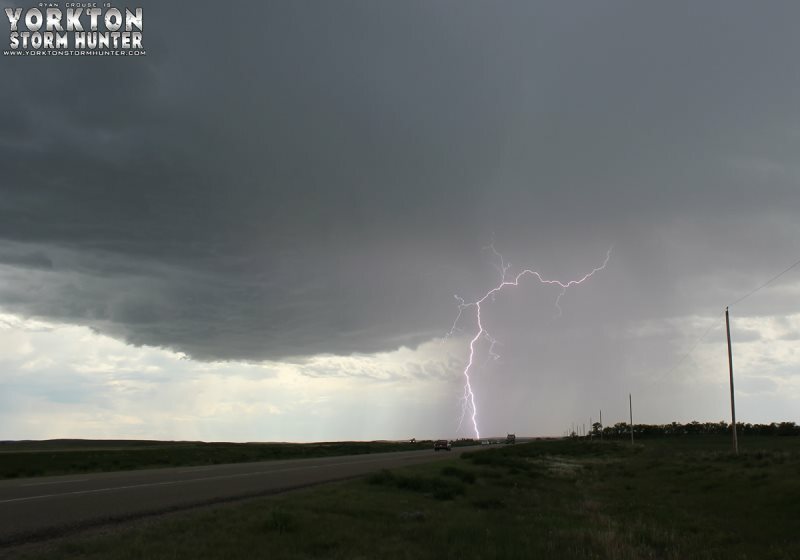 At that point it was beginning to get dark so we headed back to Swift Current (11pm) where we streamed an Awesome Lightning Show!! MANY THANKS to all the viewers and to all those who helped me out along the Journey ... Notanee Bourassa (Weather Jedi), Nick Schenher (for the directional aids), Jared Mysko (tips via Twitter), Katie Vickers (for texting in Weather Reports when I had no/bad service), Shane Armstrong (for texting Weather Tips), Braden Kowal (for texting all the jokes) ... What an AWESOME Spotter/Chaser community to pull together like we all did today! 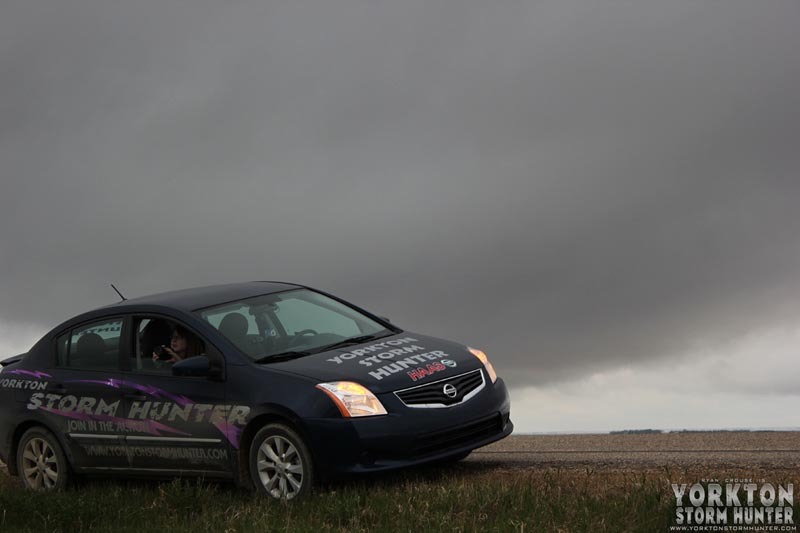 May 27 was a good chasing day for the Yorkton Storm Hunter with guest Katie Vickers. 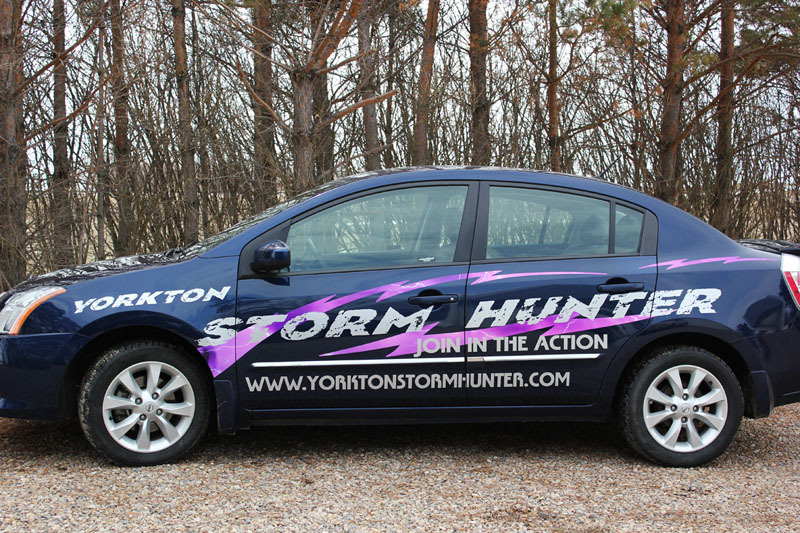 The YORKTON STORM HUNTER made it to the FRONT PAGE of the newspaper "YORKTON THIS WEEK"
Just AWESOME ... 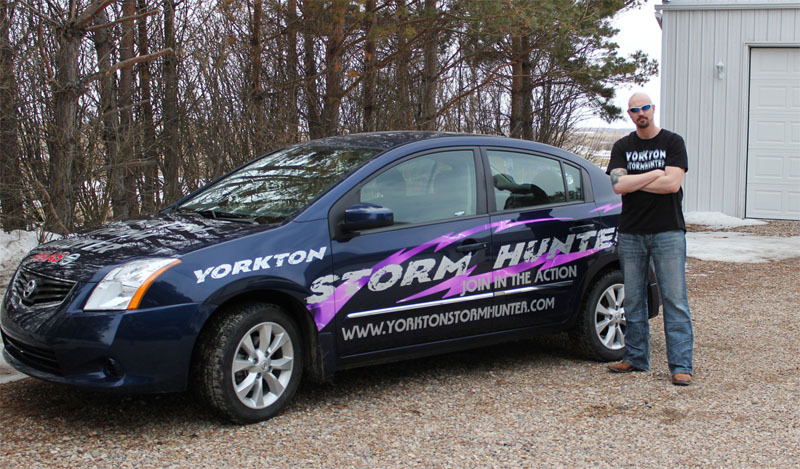 The YORKTON STORM HUNTER made it to the FRONT PAGE with a great article by Calvin Daniels!!! 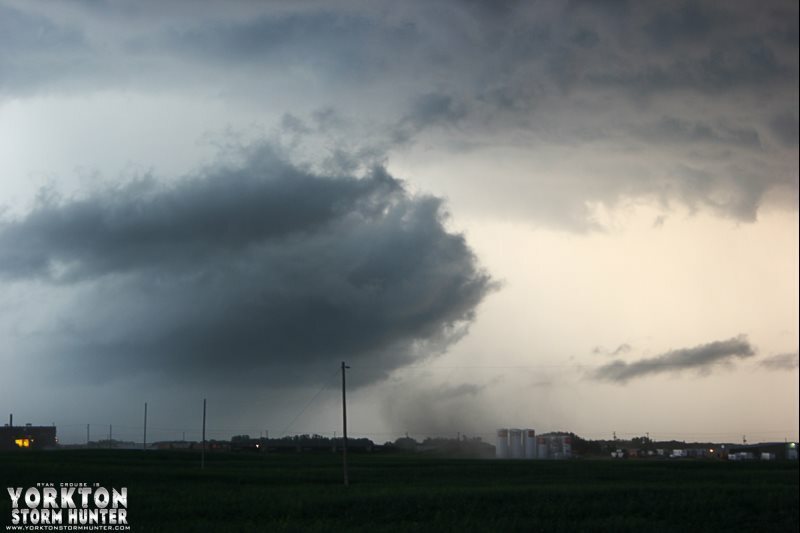 Begining (I think next week), there will be a weekly "Storm Photo Of The Week" for the rest of the 2013 Storm Season. !!! NEW CAR DECALS !!! 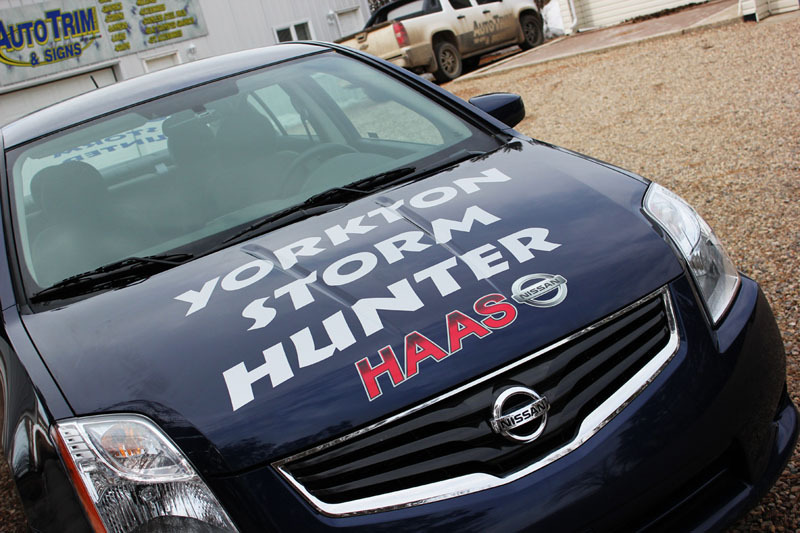 I want to give a Special Thanks to Auto-Trim Signs for the awesome Decal work and to Haas Nissan for the Sponsorship!! 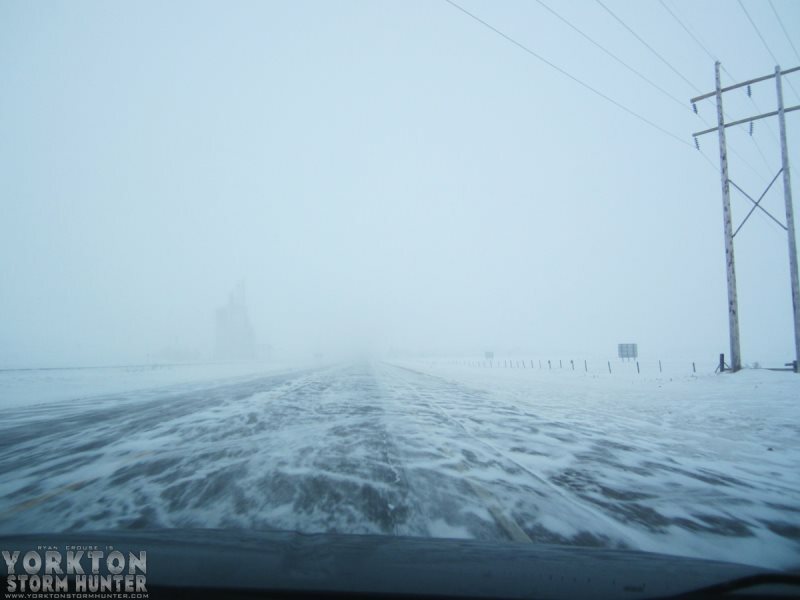 Poor visibility and road conditions around the Yorkton area.